1. 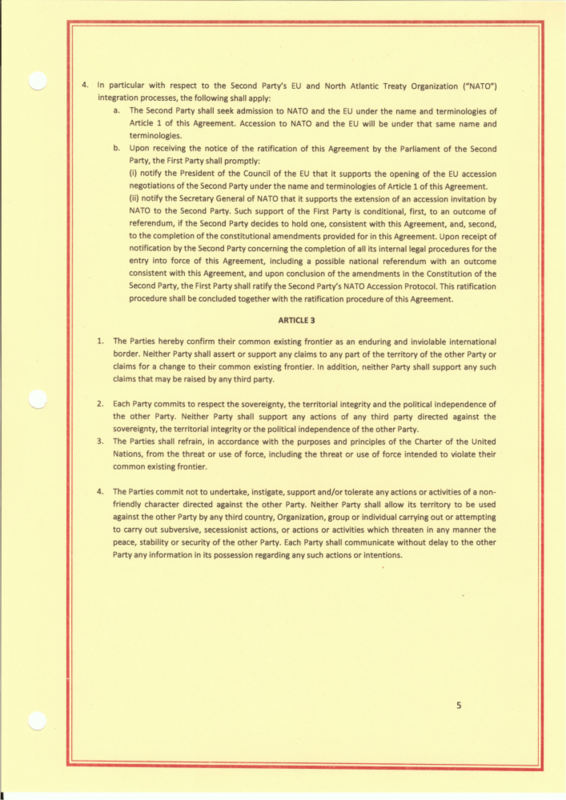 This Agreement is final and upon its entry into force terminates the Interim Accord between the Parties signed in New York on 13 September 1995. 2. 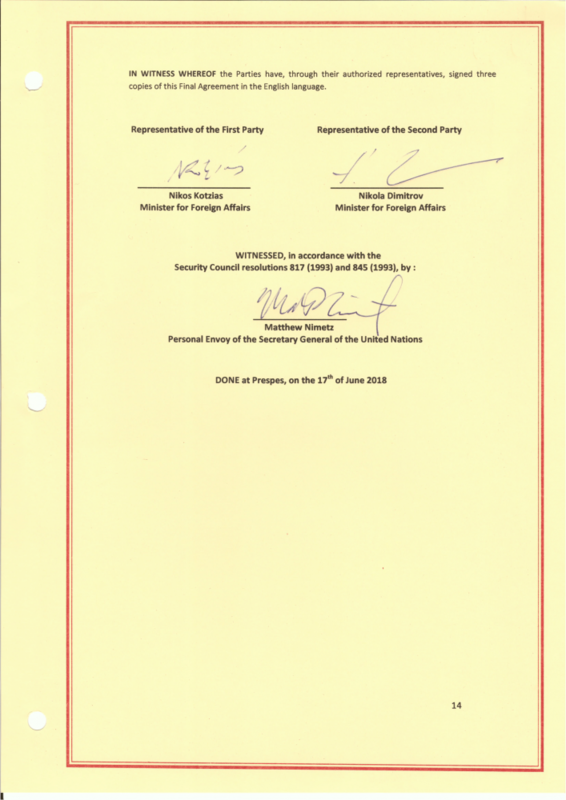 The Parties recognize as binding the outcome of the negotiations that have taken place under the auspices of the United Nations, to which both Parties have been committed pursuant to the United Nations Security Council resolutions 817 (1993) and 845 (1993) as well as the Interim Accord of 1995.
a) The official name of the Second Party shall be the “Republic of North Macedonia”, which shall be the constitutional name of the Second Party and shall be used erga omnes, as provided for in this Agreement. The short name of the Second Party shall be “North Macedonia”. b) The nationality of the Second Party shall be Macedonian/citizen of the Republic of North Macedonia, as it will be registered in all travel documents. c) The official language of the Second Party shall be the “Macedonian language”, as recognised by the Third UN Conference on the Standardization of Geographical Names, held in Athens in 1977, and described in Article 7(3) and (4) of this Agreement. d) The terms “Macedonia” and “Macedonian” have the meaning given under Article 7 of this Agreement. e) The country codes for licence plates of the Second Party shall be NM or NMK. For all other purposes, country codes remain MK and MKD, as officially assigned by the International Organization for Standardization (“ISO”). f) The adjectival reference to the State, its official organs, and other public entities shall be in line with the official name of the Second Party or its short name, that is, “of the Republic of North Macedonia” or “of North Macedonia”. Other adjectival usages, including those referring to private entities and actors, that are not related to the State and public entities, are not established by law and do not enjoy financial support from the State for activities abroad, may be in line with Article 7(3) and (4). The adjectival usage for activities may be in line with Article 7(3) and (4). This is without prejudice to the process established under Article 1 (3) (h) and compound names of cities that exist at the date of the signature of this Agreement. g) The Second Party shall adopt “Republic of North Macedonia” as its official name and the terminologies referred to in Article 1(3) through its internal procedure that is both binding and irrevocable, entailing the amendment of the Constitution as agreed in this Agreement. h) In relation to the abovementioned name and terminologies in commercial names, trademarks and brand names, the Parties agree to support and encourage their business communities to institutionalise a sincere, structured and in good faith dialogue, in the context of which will seek and reach mutually accepted solutions on the issues deriving from the commercial names, the trademarks, the brand names and all relevant matters at bilateral and international level. For the implementation of the abovementioned provisions, an international group of experts will be established consisting of representatives of the two States in the context of the European Union (“EU”) with the appropriate contribution of the United Nations and ISO. This group of experts shall be established within 2019 and conclude its work within three years. Nothing in Article 1 (3) (h) shall affect present commercial usage until mutual agreement is reached as provided in this subsection. e) The Second Party shall conclude in toto the constitutional amendments by the end of 2018. 5. Upon entry into force of this Agreement, the Parties shall use the name and terminologies of Article 1(3) in all relevant international, multilateral and regional Organizations, institutions and fora, including all meetings and correspondence, and in all their bilateral relations with all Member States of the United Nations. 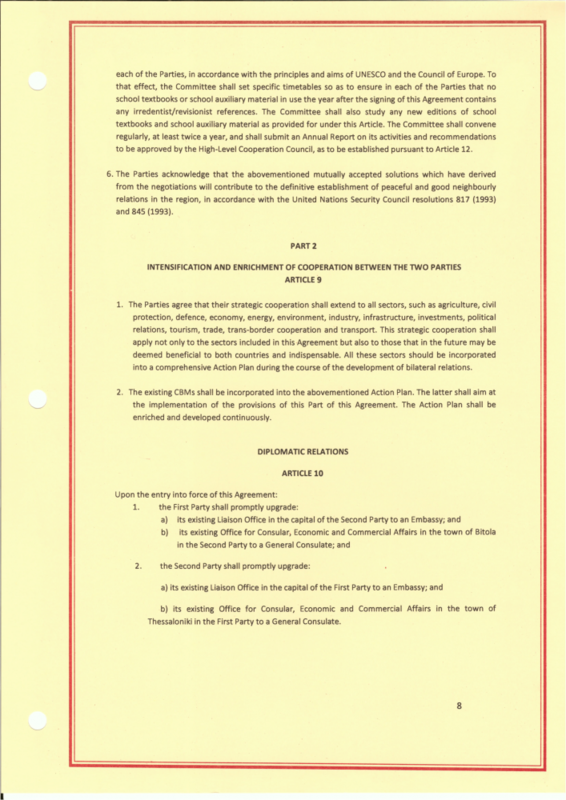 a) Notify all international, multilateral, and regional Organizations, institutions and fora of which it is a member of the entry into force of this Agreement, and request that all those Organizations, institutions and fora thereafter shall adopt and use the name and terminologies referred to in Article 1(3) of this Agreement for all usages and purposes. Both Parties shall also refer to the Second Party in accordance with Article 1(3) in all communications to, with, and in those Organizations, institutions and fora. b) Notify all Member States of the United Nations of the entry into force of this Agreement and shall request them to adopt and use the name and terminologies referred to in Article 1(3) of this Agreement for all usages and purposes, including in all their bilateral relations and communications. 7. 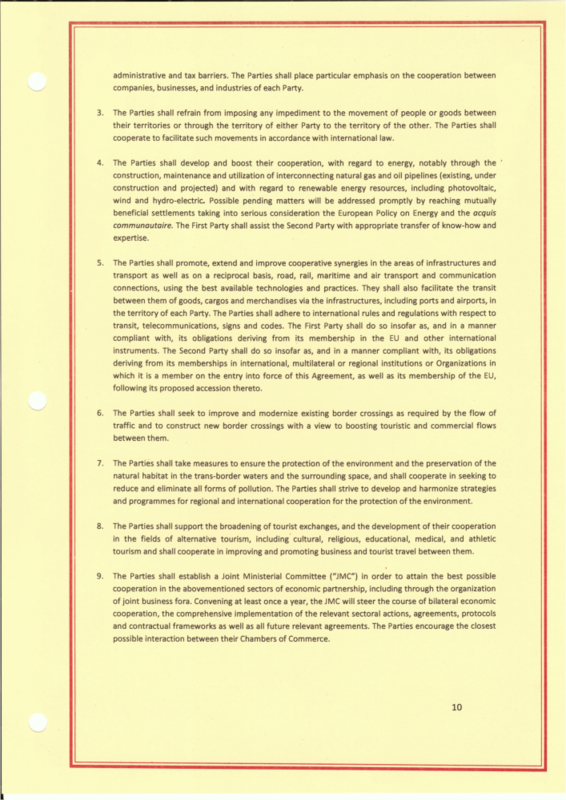 Upon entry into force of this Agreement, and subject to provisions under Articles 1(9) and (10), the terms “Macedonia”, “Republic of Macedonia”, “FYR of Macedonia”, “FYR Macedonia” in a translated or untranslated form, as well as the provisional name “the former Yugoslav Republic of Macedonia” and the acronym “fYROM” shall cease to be used to refer to the Second Party in any official context. 8. 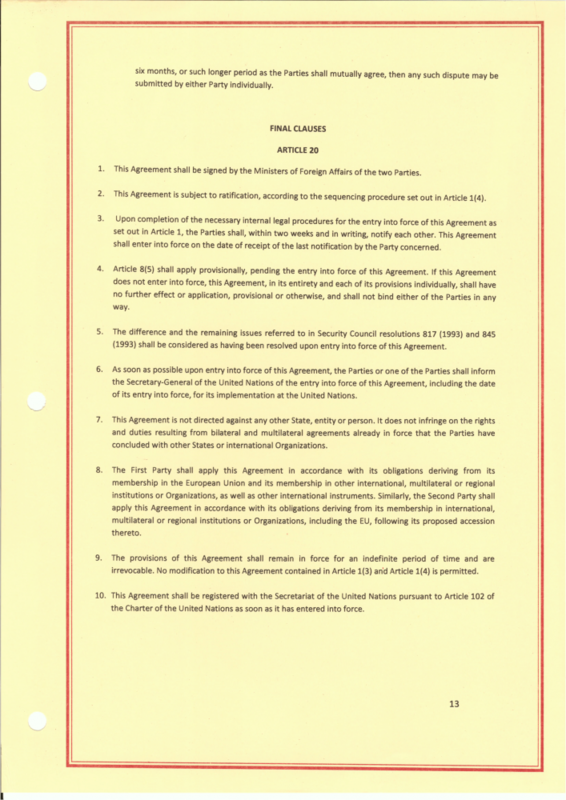 Upon entry into force of this Agreement and taking into account its Article 1(9) and (10), the Parties shall use the name and terminologies of Article 1 (3) for all usages and all purposes erga omnes, that is, domestically, in all their bilateral relations, and in all regional and international Organizations and institutions. 9. 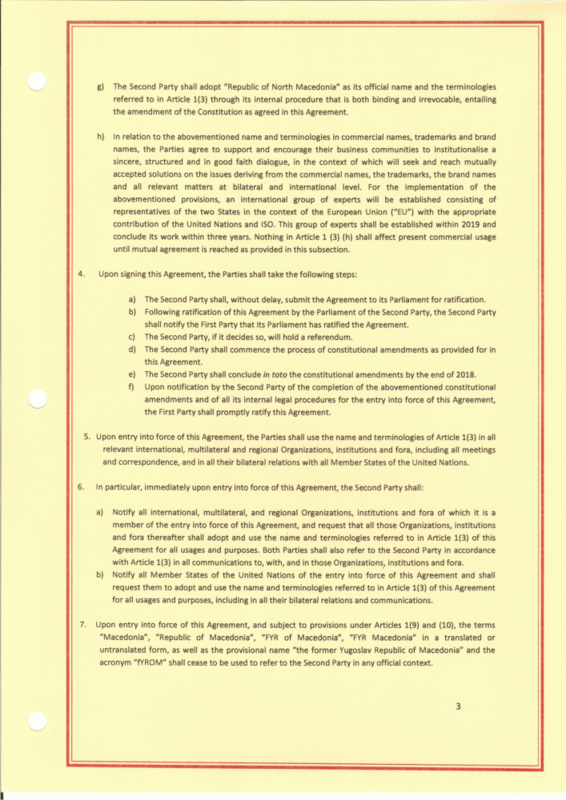 Upon entry into force of this Agreement, the Second Party shall promptly in accordance with sound administrative practice take all necessary measures so as the country’s competent Authorities henceforth use internally the name and terminologies of Article 1(3) of this Agreement in all new official documentation, correspondence and relevant materials. a) The “technical” transitional period shall relate to all official documents and materials of the Public Administration of the Second Party for international usage and to those for internal usage that may be used externally. These documents and materials shall be renewed in accordance with the name and terminologies as referred to in Article 1(3) of this Agreement within five years from the entry into force of this Agreement, at the latest. b) The “political” transitional period shall relate to all documents and materials exclusively for internal usage in the Second Party. The issuance of the documents and materials falling under this category in accordance with Article 1 (3) shall commence at the opening of each EU negotiation chapter in the relevant field, and shall be finalised within five years thereof. 11. Procedures for the prompt amendment of the Constitution of the Second Party, in order to fully implement the provisions of this Agreement, shall commence upon ratification of this Agreement by its Parliament or following a referendum, if the Second Party decides to hold one. 12. The name and terminologies as referred to in Article 1 of this Agreement shall be incorporated in the Constitution of the Second Party. This change shall take place en bloc with one amendment. Pursuant to this amendment, the name and terminologies will change accordingly in all articles of the Constitution. Furthermore, the Second Party shall proceed to the appropriate amendments of its Preamble, Article 3 and Article 49, during the procedure of the revision of the Constitution. 13. 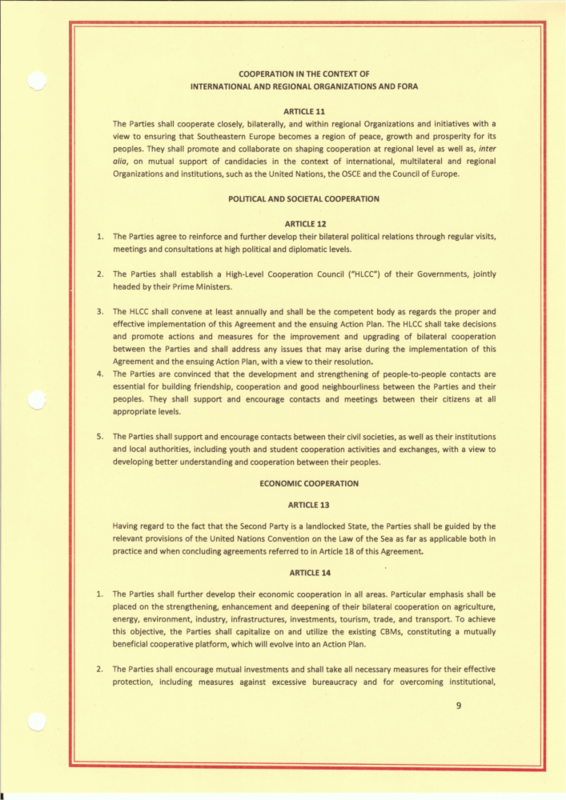 In the event of mistakes, errors, omissions in the proper reference of the name and terminologies referred to in Article 1(3) of this Agreement in the context of international, multilateral and regional Organizations, institutions, correspondence, meetings and fora, as well as in all bilateral relations of the Second Party with third States and entities, either of the Parties may request their immediate rectification and the avoidance of similar mistakes in the future. 1. 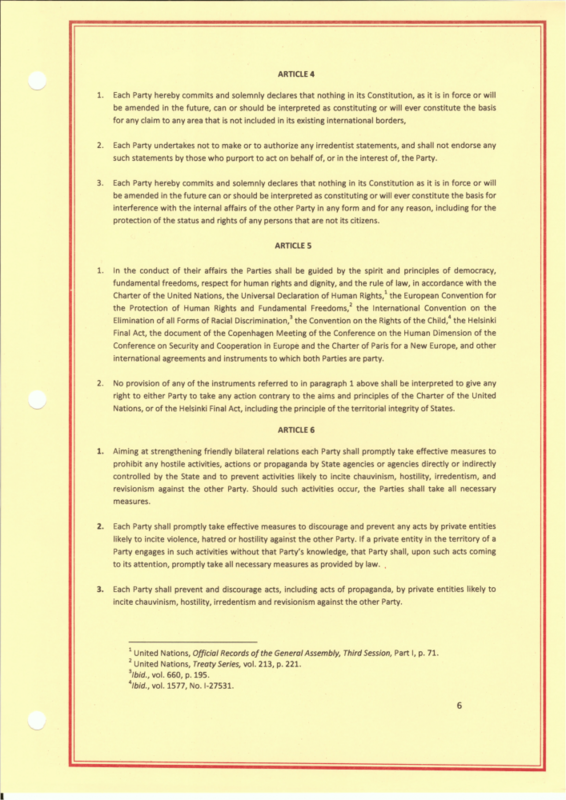 The First Party agrees not to object to the application by or the membership of the Second Party under the name and terminologies of Article 1 (3) of this Agreement in international, multilateral and regional Organizations and institutions of which the First Party is a member. 2. The Second Party shall seek admission to International, multilateral and regional Organizations and Institutions under the name and terminologies of Article 1 (3) of this Agreement. 3. Upon entry into force of this Agreement pursuant to its Article 1, the First Party shall ratify any of the Second Party’s accession agreement to International Organizations, of which the First Party is a member. a) The Second Party shall seek admission to NATO and the EU under the name and terminologies of Article 1 of this Agreement. Accession to NATO and the EU will be under that same name and terminologies. (i) notify the President of the Council of the EU that it supports the opening of the EU accession negotiations of the Second Party under the name and terminologies of Article 1 of this Agreement. (ii) notify the Secretary General of NATO that it supports the extension of an accession invitation by NATO to the Second Party. Such support of the First Party is conditional, first, to an outcome of referendum, if the Second Party decides to hold one, consistent with this Agreement, and, second, to the completion of the constitutional amendments provided for in this Agreement. 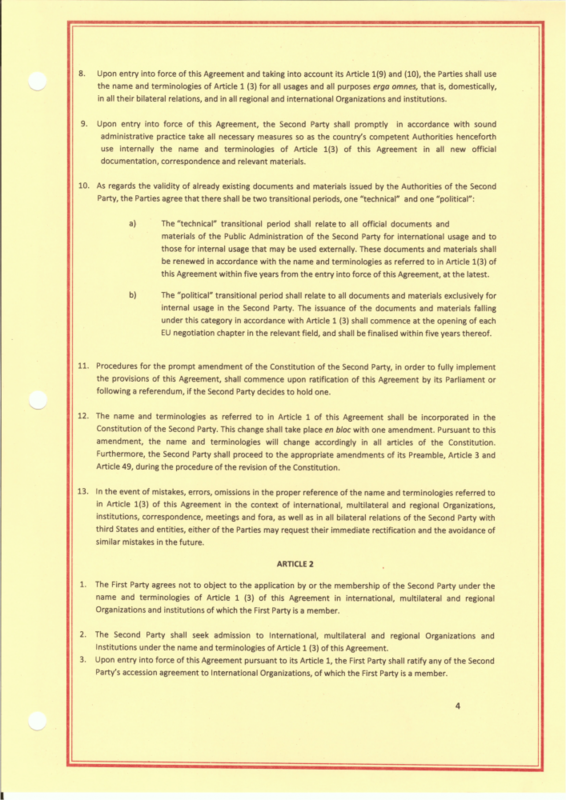 Upon receipt of notification by the Second Party concerning the completion of all its internal legal procedures for the entry into force of this Agreement, including a possible national referendum with an outcome consistent with this Agreement, and upon conclusion of the amendments in the Constitution of the Second Party, the First Party shall ratify the Second Party’s NATO Accession Protocol. This ratification procedure shall be concluded together with the ratification procedure of this Agreement. 1. Τhe Parties hereby confirm their common existing frontier as an enduring and inviolable international border. Neither Party shall assert or support any claims to any part of the territory of the other Party or claims for a change to their common existing frontier. In addition, neither Party shall support any such claims that may be raised by any third party. 2. Each Party commits to respect the sovereignty, the territorial integrity and the political independence of the other Party. Neither Party shall support any actions of any third party directed against the sovereignty, the territorial integrity or the political independence of the other Party. 3. The Parties shall refrain, in accordance with the purposes and principles of the Charter of the United Nations, from the threat or use of force, including the threat or use of force intended to violate their common existing frontier. 4. The Parties commit not to undertake, instigate, support and/or tolerate any actions or activities of a non-friendly character directed against the other Party. Neither Party shall allow its territory to be used against the other Party by any third country, Organization, group or individual carrying out or attempting to carry out subversive, secessionist actions, or actions or activities which threaten in any manner the peace, stability or security of the other Party. Each Party shall communicate without delay to the other Party any information in its possession regarding any such actions or intentions. 2. Each Party undertakes not to make or to authorize any irredentist statements, and shall not endorse any such statements by those who purport to act on behalf of, or in the interest of, the Party. 3. Each Party hereby commits and solemnly declares that nothing in its Constitution as it is in force or will be amended in the future can or should be interpreted as constituting or will ever constitute the basis for interference with the internal affairs of the other Party in any form and for any reason, including for the protection of the status and rights of any persons that are not its citizens. 1. In the conduct of their affairs the Parties shall be guided by the spirit and principles of democracy, fundamental freedoms, respect for human rights and dignity, and the rule of law, in accordance with the Charter of the United Nations, the Universal Declaration of Human Rights, the European Convention for the Protection of Human Rights and Fundamental Freedoms, the International Convention on the Elimination of all Forms of Racial Discrimination, the Convention on the Rights of the Child, the Helsinki Final Act, the document of the Copenhagen Meeting of the Conference on the Human Dimension of the Conference on Security and Cooperation in Europe and the Charter of Paris for a New Europe, and other international agreements and instruments to which both Parties are party. 2. 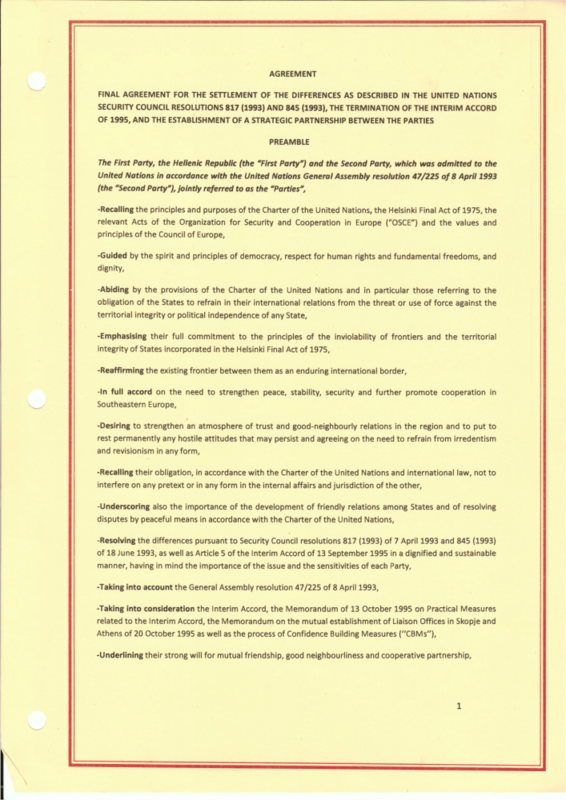 No provision of any of the instruments referred to in paragraph 1 above shall be interpreted to give any right to either Party to take any action contrary to the aims and principles of the Charter of the United Nations, or of the Helsinki Final Act, including the principle of the territorial integrity of States. 1. Aiming at strengthening friendly bilateral relations each Party shall promptly take effective measures to prohibit any hostile activities, actions or propaganda by State agencies or agencies directly or indirectly controlled by the State and to prevent activities likely to incite chauvinism, hostility, irredentism, and revisionism against the other Party. Should such activities occur, the Parties shall take all necessary measures. 2. Each Party shall promptly take effective measures to discourage and prevent any acts by private entities likely to incite violence, hatred or hostility against the other Party. If a private entity in the territory of a Party engages in such activities without that Party’s knowledge, that Party shall, upon such acts coming to its attention, promptly take all necessary measures as provided by law. 3. Each Party shall prevent and discourage acts, including acts of propaganda, by private entities likely to incite chauvinism, hostility, irredentism and revisionism against the other Party. 1. The Parties acknowledge that their respective understanding of the terms “Macedonia” and “Macedonian” refers to a different historical context and cultural heritage. 2. When reference is made to the First Party, these terms denote not only the area and people of the northern region of the First Party, but also their attributes, as well as the Hellenic civilization, history, culture, and heritage of that region from antiquity to present day. 3. When reference is made to the Second Party, these terms denote its territory, language, people and their attributes, with their own history, culture, and heritage, distinctly different from those referred to under Article 7(2). 4. The Second Party notes that its official language, the Macedonian language, is within the group of South Slavic languages. The Parties note that the official language and other attributes of the Second Party are not related to the ancient Hellenic civilization, history, culture and heritage of the northern region of the First Party. 5. Nothing in this Agreement is intended to denigrate in any way, or to alter or affect, the usage by the citizens of either Party. 1. If either Party believes one or more symbols constituting part of its historic or cultural patrimony is being used by the other Party, it shall bring such alleged use to the attention of the other Party, and the other Party shall take appropriate corrective action to effectively address the issue and ensure respect for the said patrimony. 2. Within six months following the entry into force of this Agreement, the Second Party shall review the status of monuments, public buildings and infrastructures on its territory, and insofar as they refer in any way to ancient Hellenic history and civilization constituting an integral component of the historic or cultural patrimony of the First Party, shall take appropriate corrective action to effectively address the issue and ensure respect for the said patrimony. 3. The Second Party shall not use again in any way and in all its forms the symbol formerly displayed on its former national flag. Within six months of the entry into force of this Agreement, the Second Party shall proceed to the removal of the symbol displayed on its former national flag from all public sites and public usages on its territory. Archaeological artefacts do not fall within the scope of this provision. 4. Each Party shall abide by the recommendations of the United Nations Conference on the Standardization of Geographical Names in relation to the use of the official geographical names and toponyms in the territory of the other Party thus giving priority to the use of endonyms over exonyms. 5. 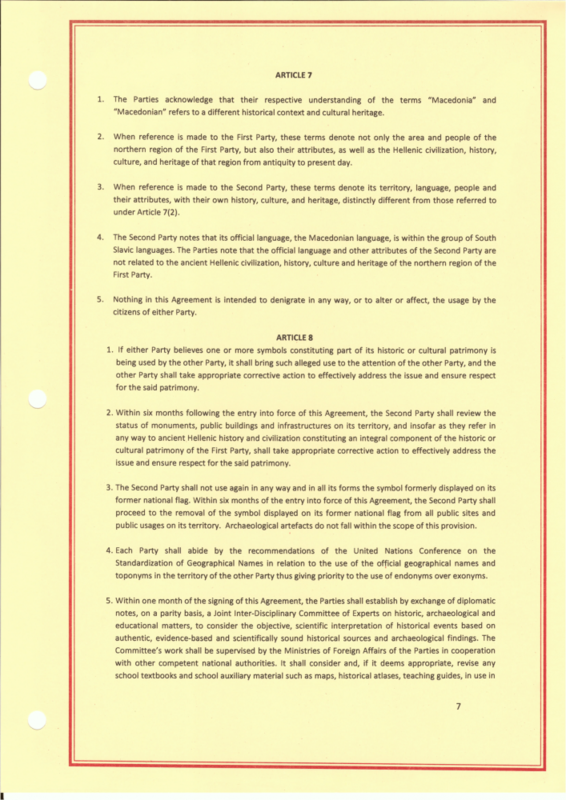 Within one month of the signing of this Agreement, the Parties shall establish by exchange of diplomatic notes, on a parity basis, a Joint Inter-Disciplinary Committee of Experts on historic, archaeological and educational matters, to consider the objective, scientific interpretation of historical events based on authentic, evidence-based and scientifically sound historical sources and archaeological findings. The Committee’s work shall be supervised by the Ministries of Foreign Affairs of the Parties in cooperation with other competent national authorities. It shall consider and, if it deems appropriate, revise any school textbooks and school auxiliary material such as maps, historical atlases, teaching guides, in use in each of the Parties, in accordance with the principles and aims of UNESCO and the Council of Europe. To that effect, the Committee shall set specific timetables so as to ensure in each of the Parties that no school textbooks or school auxiliary material in use the year after the signing of this Agreement contains any irredentist/revisionist references. The Committee shall also study any new editions of school textbooks and school auxiliary material as provided for under this Article. The Committee shall convene regularly, at least twice a year, and shall submit an Annual Report on its activities and recommendations to be approved by the High-Level Cooperation Council, as to be established pursuant to Article 12. 6. The Parties acknowledge that the abovementioned mutually accepted solutions which have derived from the negotiations will contribute to the definitive establishment of peaceful and good neighbourly relations in the region, in accordance with the United Nations Security Council resolutions 817 (1993) and 845 (1993). 1. The Parties agree that their strategic cooperation shall extend to all sectors, such as agriculture, civil protection, defence, economy, energy, environment, industry, infrastructure, investments, political relations, tourism, trade, trans-border cooperation and transport. This strategic cooperation shall apply not only to the sectors included in this Agreement but also to those that in the future may be deemed beneficial to both countries and indispensable. All these sectors should be incorporated into a comprehensive Action Plan during the course of the development of bilateral relations. 2. The existing CBMs shall be incorporated into the abovementioned Action Plan. The latter shall aim at the implementation of the provisions of this Part of this Agreement. The Action Plan shall be enriched and developed continuously. b) its existing Office for Consular, Economic and Commercial Affairs in the town of Thessaloniki in the First Party to a General Consulate. The Parties shall cooperate closely, bilaterally, and within regional Organizations and initiatives with a view to ensuring that Southeastern Europe becomes a region of peace, growth and prosperity for its peoples. They shall promote and collaborate on shaping cooperation at regional level as well as, inter alia, on mutual support of candidacies in the context of international, multilateral and regional Organizations and institutions, such as the United Nations, the OSCE and the Council of Europe. 1. The Parties agree to reinforce and further develop their bilateral political relations through regular visits, meetings and consultations at high political and diplomatic levels. 2. The Parties shall establish a High-Level Cooperation Council (“HLCC”) of their Governments, jointly headed by their Prime Ministers. 3. The HLCC shall convene at least annually and shall be the competent body as regards the proper and effective implementation of this Agreement and the ensuing Action Plan. The HLCC shall take decisions and promote actions and measures for the improvement and upgrading of bilateral cooperation between the Parties and shall address any issues that may arise during the implementation of this Agreement and the ensuing Action Plan, with a view to their resolution. 4. The Parties are convinced that the development and strengthening of people-to-people contacts are essential for building friendship, cooperation and good neighbourliness between the Parties and their peoples. They shall support and encourage contacts and meetings between their citizens at all appropriate levels. 5. The Parties shall support and encourage contacts between their civil societies, as well as their institutions and local authorities, including youth and student cooperation activities and exchanges, with a view to developing better understanding and cooperation between their peoples. Having regard to the fact that the Second Party is a landlocked State, the Parties shall be guided by the relevant provisions of the United Nations Convention on the Law of the Sea as far as applicable both in practice and when concluding agreements referred to in Article 18 of this Agreement. 1. The Parties shall further develop their economic cooperation in all areas. Particular emphasis shall be placed on the strengthening, enhancement and deepening of their bilateral cooperation on agriculture, energy, environment, industry, infrastructures, investments, tourism, trade, and transport. To achieve this objective, the Parties shall capitalize on and utilize the existing CBMs, constituting a mutually beneficial cooperative platform, which will evolve into an Action Plan. 2. The Parties shall encourage mutual investments and shall take all necessary measures for their effective protection, including measures against excessive bureaucracy and for overcoming institutional, administrative and tax barriers. The Parties shall place particular emphasis on the cooperation between companies, businesses, and industries of each Party. 3. The Parties shall refrain from imposing any impediment to the movement of people or goods between their territories or through the territory of either Party to the territory of the other. The Parties shall cooperate to facilitate such movements in accordance with international law. 4. The Parties shall develop and boost their cooperation, with regard to energy, notably through the construction, maintenance and utilization of interconnecting natural gas and oil pipelines (existing, under construction and projected) and with regard to renewable energy resources, including photovoltaic, wind and hydro-electric. Possible pending matters will be addressed promptly by reaching mutually beneficial settlements taking into serious consideration the European Policy on Energy and the acquis communautaire. The First Party shall assist the Second Party with appropriate transfer of know-how and expertise. 5. The Parties shall promote, extend and improve cooperative synergies in the areas of infrastructures and transport as well as on a reciprocal basis, road, rail, maritime and air transport and communication connections, using the best available technologies and practices. They shall also facilitate the transit between them of goods, cargos and merchandises via the infrastructures, including ports and airports, in the territory of each Party. The Parties shall adhere to international rules and regulations with respect to transit, telecommunications, signs and codes. The First Party shall do so insofar as, and in a manner compliant with, its obligations deriving from its membership in the EU and other international instruments. The Second Party shall do so insofar as, and in a manner compliant with, its obligations deriving from its memberships in international, multilateral or regional institutions or Organizations in which it is a member on the entry into force of this Agreement, as well as its membership of the EU, following its proposed accession thereto. 6. The Parties shall seek to improve and modernize existing border crossings as required by the flow of traffic and to construct new border crossings with a view to boosting touristic and commercial flows between them. 7. The Parties shall take measures to ensure the protection of the environment and the preservation of the natural habitat in the trans-border waters and the surrounding space, and shall cooperate in seeking to reduce and eliminate all forms of pollution. The Parties shall strive to develop and harmonize strategies and programmes for regional and international cooperation for the protection of the environment. 8. The Parties shall support the broadening of tourist exchanges, and the development of their cooperation in the fields of alternative tourism, including cultural, religious, educational, medical, and athletic tourism and shall cooperate in improving and promoting business and tourist travel between them. 9. The Parties shall establish a Joint Ministerial Committee (“JMC”) in order to attain the best possible cooperation in the abovementioned sectors of economic partnership, including through the organization of joint business fora. Convening at least once a year, the JMC will steer the course of bilateral economic cooperation, the comprehensive implementation of the relevant sectoral actions, agreements, protocols and contractual frameworks as well as all future relevant agreements. The Parties encourage the closest possible interaction between their Chambers of Commerce. 1. The Parties shall develop and improve their scientific, technological and technical cooperation as well as their collaboration in the area of education. They shall intensify their exchanges of information and of scientific and technical documentation and shall strive to improve mutual access to scientific and research institutions, archives, libraries and similar institutions. The Parties shall support initiatives by scientific and educational institutions as well as by individuals aimed at improving cooperation and exchanges in the areas of sciences, technology and education. 2. The Parties shall encourage and support events as well as scientific and educational programmes in which members of their scientific and academic communities shall participate. They shall also encourage and support the convening of bilateral and international conferences in these areas. 3. The Parties attach great significance to the development of research into, and the implementation and utilization of new technologies, including digital technology and nanotechnology, in a manner that is environmentally friendly and upgrades the skills, capacities and overall well-being of their citizens. To that end they shall develop the cooperation amongst their research centres, researchers and academic institutional systems. The Parties shall place special emphasis on the development of cultural relations between the two States, their societies and their social groups, having particular regard to arts, dance, cinematography, music and theatre. In this regard, particular importance shall be given to sports. Bilateral collaboration on the domain of health, including health care, shall be promoted. 1. 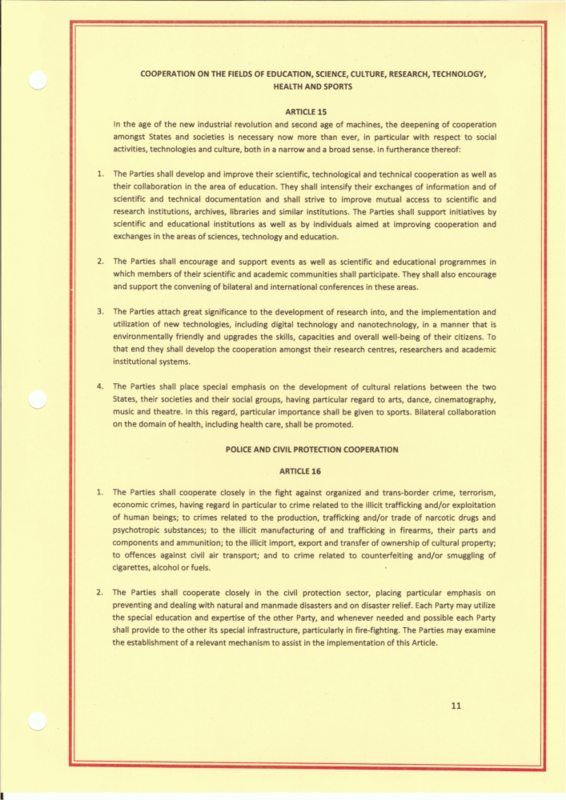 The Parties shall cooperate closely in the fight against organized and trans-border crime, terrorism, economic crimes, having regard in particular to crime related to the illicit trafficking and/or exploitation of human beings; to crimes related to the production, trafficking and/or trade of narcotic drugs and psychotropic substances; to the illicit manufacturing of and trafficking in firearms, their parts and components and ammunition; to the illicit import, export and transfer of ownership of cultural property; to offences against civil air transport; and to crime related to counterfeiting and/or smuggling of cigarettes, alcohol or fuels. 2. The Parties shall cooperate closely in the civil protection sector, placing particular emphasis on preventing and dealing with natural and manmade disasters and on disaster relief. Each Party may utilize the special education and expertise of the other Party, and whenever needed and possible each Party shall provide to the other its special infrastructure, particularly in fire-fighting. The Parties may examine the establishment of a relevant mechanism to assist in the implementation of this Article. The Parties shall reinforce and expand their cooperation in the area of defence, including through frequent visits and contacts between the political and military leadership of their armed forces, the appropriate transfer of know-how and capacity-building, the cooperation in the areas of production, information and joint military exercises. Special emphasis shall be placed on personnel training which the Parties could provide to each other. c) The agreement concerning hydro-economic questions. 2. The Parties agree that, upon entry into force of the present Agreement, all international documents binding on the Parties bilaterally shall remain in force, unless specifically terminated by this Agreement. 3. The Parties shall consult with each other in order to identify other agreements concluded between the former Socialist Federal Republic of Yugoslavia and the First Party that will be deemed suitable for application in their mutual relations. 4. The Parties commit to explore all possibilities to conclude additional bilateral agreements needed with regard to areas of mutual interest. 1. The Parties shall settle any disputes exclusively by peaceful means in accordance with the Charter of the United Nations. 2. In the event that a Party considers that the other Party is not acting in accordance with the provisions of this Agreement, this Party shall first notify the other Party of its concerns and shall seek a solution by negotiation. If the Parties are unable to resolve the matter bilaterally, the Parties may agree to request the Secretary-General of the United Nations to use his good offices to resolve the matter. 3. 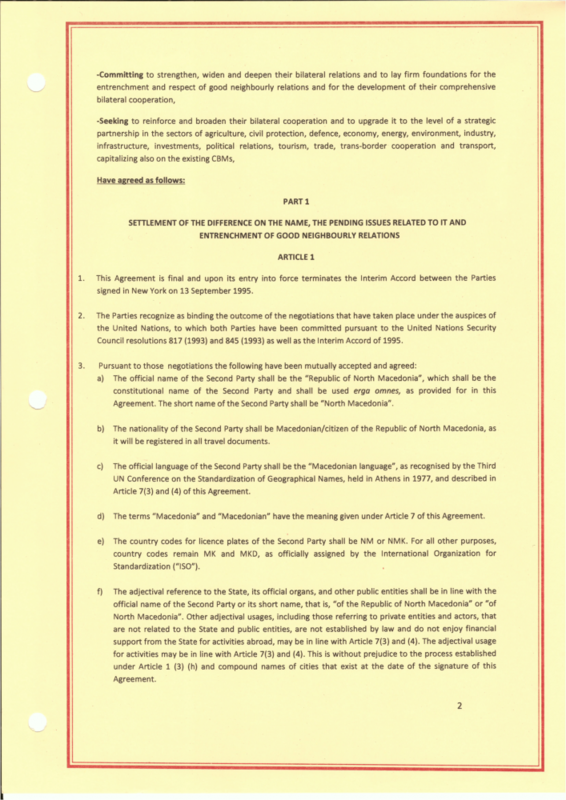 Any dispute that arises between the Parties concerning the interpretation or implementation of this Agreement and not resolved according to the procedures referred to under Article 19(2), may be submitted to the International Court of Justice. The Parties should first seek to agree upon a joint submission to said Court regarding any such dispute. 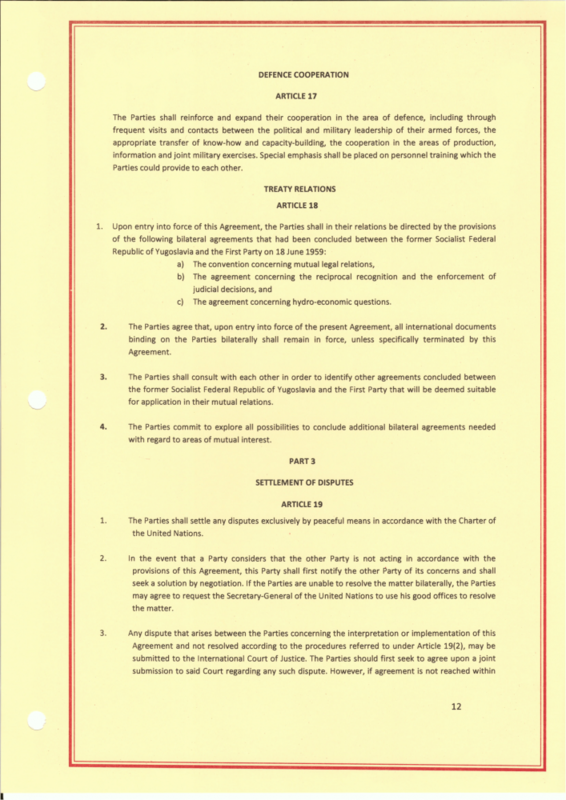 However, if agreement is not reached within six months, or such longer period as the Parties shall mutually agree, then any such dispute may be submitted by either Party individually. 1. This Agreement shall be signed by the Ministers of Foreign Affairs of the two Parties. 2. This Agreement is subject to ratification, according to the sequencing procedure set out in Article 1(4). 3. Upon completion of the necessary internal legal procedures for the entry into force of this Agreement as set out in Article 1, the Parties shall, within two weeks and in writing, notify each other. This Agreement shall enter into force on the date of receipt of the last notification by the Party concerned. 4. Article 8(5) shall apply provisionally, pending the entry into force of this Agreement. If this Agreement does not enter into force, this Agreement, in its entirety and each of its provisions individually, shall have no further effect or application, provisional or otherwise, and shall not bind either of the Parties in any way. 5. The difference and the remaining issues referred to in Security Council resolutions 817 (1993) and 845 (1993) shall be considered as having been resolved upon entry into force of this Agreement. 6. As soon as possible upon entry into force of this Agreement, the Parties or one of the Parties shall inform the Secretary-General of the United Nations of the entry into force of this Agreement, including the date of its entry into force, for its implementation at the United Nations. 7. This Agreement is not directed against any other State, entity or person. It does not infringe on the rights and duties resulting from bilateral and multilateral agreements already in force that the Parties have concluded with other States or international Organizations. 8. The First Party shall apply this Agreement in accordance with its obligations deriving from its membership in the European Union and its membership in other international, multilateral or regional institutions or Organizations, as well as other international instruments. Similarly, the Second Party shall apply this Agreement in accordance with its obligations deriving from its membership in international, multilateral or regional institutions or Organizations, including the EU, following its proposed accession thereto. 9. The provisions of this Agreement shall remain in force for an indefinite period of time and are irrevocable. No modification to this Agreement contained in Article 1(3) and Article 1(4) is permitted. 10. This Agreement shall be registered with the Secretariat of the United Nations pursuant to Article 102 of the Charter of the United Nations as soon as it has entered into force.